Business phone systems and voice/data cabling, with offices in Austin, San Antonio, Brownsville, TX and New Orleans, LA. description of the facilities, phone numbers, flight schedules, cargo and runway data. Commercial appraisal firm serving the Texas border regions of El Paso, Laredo, McAllen, Brownsville and Santa Teresa. John Deere dealer and exporter with locations in Harlingen and Brownsville. flight schedules, directions, information on ground transportation and restaurant, phone numbers, statistics, news and runway data. Full service lender with locations in Austin, Brownsville, San Antonio, Dallas, McAllen, and Bandera. Online application, loan calculators, FAQ, glossary and directory of staff. Locally owned bank serving West Tennessee with offices in Brownsville, Millington, Atoka, Covington, and Memphis. History, locations, online banking, and information about services. A full-service bank serving South Texas with 26 banking locations from Brownsville to Roma. bunker fuel, lubricants, marine services u.s. gulf, brownsville, texas to lake charles, louisiana - truck, barge, dockside, offshore. product terminals, environmental services - waste water treatment. Brownsville, Tennessee dealer of fine American and European antiques. Publishes detailed street, wall, and custom maps of South Texas including Corpus Christi, McAllen, Brownsville, Victoria, Laredo and the Rio Grande Valley. 12 Tripp Country Hams Brownsville, Tennessee. Brownsville, Tennessee. Offers sliced and whole country hams, country bacon, ham hocks, and sorghum molasses. Located in Brownsville. Specializing in diabetes management. Photograph gallery and litter announcements. Brownsville, Wisconsin. Offers fishing and hunting packages in the Rio Grande Valley. Located near Brownsville. Contains information on bill payments, careers, community calendar, local news and phone directory. Hospital in Brownsville, TX. Includes map, phone directory, list of services, and billing information. Standing six stallions including Etch A Marshall and Doctor Debionaire, and listing stock for sale. Located in Brownsville. Features pull-thru sites with free TV, pool, clubhouse, and rental units. Located in historic area of Brownsville, near the Gulf of Mexico. Calendar of activities, photo gallery, membership discounts, and directions. Provides a range of health and wellness services for the Brownsville community. Site also contains medical information, interactive health features, and employment opportunities. Ophthalmology and optometry group offering laser vision correction, cataract surgery, and other eye care services in Paris, Jackson, Memphis, Union City, Brownsville, Bolivar, and Martin. Includes physician profiles and descriptions of procedures. Offers an intensive basic dental care training program exclusively for missionaries. Includes the instructors profile, skills taught, and a list of instruments and supplies needed. Located in Brownsville, Texas, United States. Located in Brownsville. Features full hook-up sites, tent camping, heated pool, golf driving range, and free daytrips to Mexico. Also offers on-site mobile homes, park models, and RVs for rent. Photos, FAQ, information on park activities and facilities, and rates. An annual gaming convention the first weekend in November at the Ascutney Mountain Resort in Brownsville, Vt. Features RPGs, Historical and Fantasy Miniatures, CCGs, Board Gaming, LARPs, and Networked Computer Gaming. Meets on the 1st Monday, 7:30 PM. Calendar, officers, map and links. defense-oriented litigation firm based in brownsville. Meets on the 1st and 3rd Fridays, 7:00 PM. Photos, officers, schedule, forum and links. Information on topics such as Catholicism, Brownsville, Freemasonry, Shepherds Chapel and Christian doctrine from a fundamentalist Pentecostal perspective. Articles and news relating to the revival movement, especially in the Brownsville Assembly of God. brownsville attorney, offering services for criminal defense, family law, personal injury, employment disputes, product liability, and litigation. specializes in company start-up, with offices in matamoros, reynosa, mexico city, as well as brownsville, texas. describes services offered and firm members. brownsville firm offering services for matters including personal injury, criminal defense, disability claims, estate planning and administration, and family law. 38 Saint Joseph Academy Brownsville, Texas. Addresses the deception of the 'Third Wave' movement - Kenneth Copeland, Benny Hinn, Rodney Howard-Browne, the Vineyard & Kansas City Prophets, Toronto 'Blessing' churches, Brownsville A/G of Pensacola and others. Drive-in located in Brownsville. Also has a miniature golf course. Includes movie listings plus behind the scenes photos. Current show information, the season schedule, background and history. See the concession menu for this Brownsville drive-in theatre. Also, has information about the Friends of Malden. SiteBook Brownsville City Portrait of Brownsville in California. 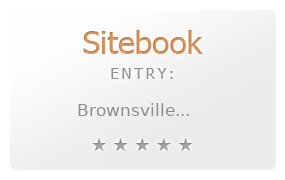 This Topic site Brownsville got a rating of 4 SiteBook.org Points according to the views of this profile site.